Have you ever heard a fairy make music? 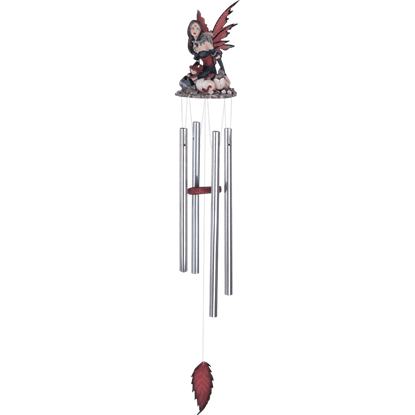 With one of our fairy wind chimes, you can listen to a pretty little pixie as she makes music any time the wind blows and causes her hanging chimes to drift and sway, causing a series of notes that will create a melody that will help you relax and unwind, all while the pretty sounds soothe your soul. 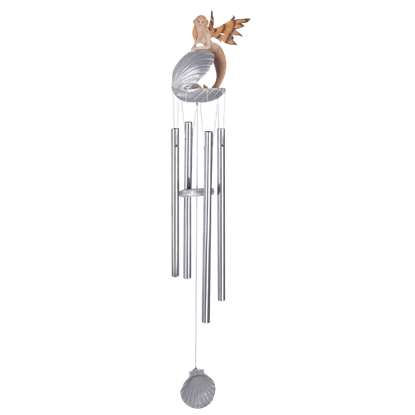 Wind chimes are not just for outdoors, and that is why these fairy chimes are perfect for virtually any location, whether you are displaying them on a porch, a veranda, or in your home or office! Of course, when they are indoors, a lack of wind will keep them still, although that is an easily solved problem with just a brush of your fingertips! Astonishing in their appearance, these wind chimes are impressive to see, possessing vivid coloration and stunning detail, so much so that they make fine decorations to hang up as well as great gifts to give to any fairy enthusiast you might know. 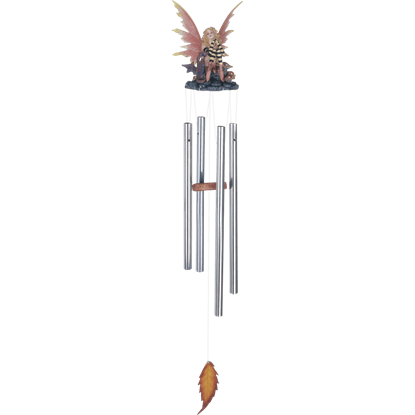 The combination of a highly detailed look and a classic sound ensure that whether you see it, hear it, or both, you will always be impressed by one of these fantasy wind chimes. Day or night, still or moving, these fairy wind chimes are great decorations that will leave you mesmerized, both by the sound of sweet fairy music produced by the chimes and by the beauty of the pretty little fairies that adorn these decor pieces. The Dragon Hatchling Fairy Wind Chime features a fairy dressed in red and black, kneeling on a rocky cliff next to dragon eggs. These little dragons are hatching and the fairy is there to care for them, creating an impressive scene. 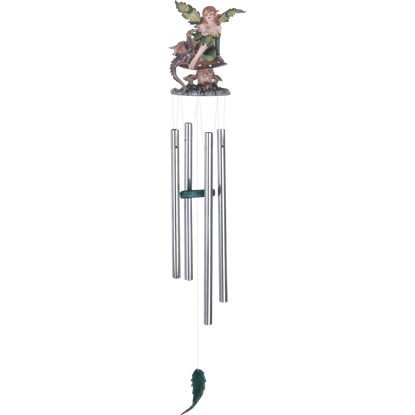 The Elven Garden Fairy Wind Chime features a beautiful elven fairy with wings in shades of green. She sits on a small green fern and blows bubbles all day. This stunning wind chime is made of cold cast resin and measures 24 inches. The Fairy and Dragon Wind Chime features a beautiful blonde fairy with black and yellow stripped tights. She is surrounded by toadstools, and there is a red and purple dragon at her side. This stunning wind chime is made of cast resin. Fairies have wings so that the wind may carry them, but sometimes, a fairy would rather just sit on a toadstool and feel the breeze. 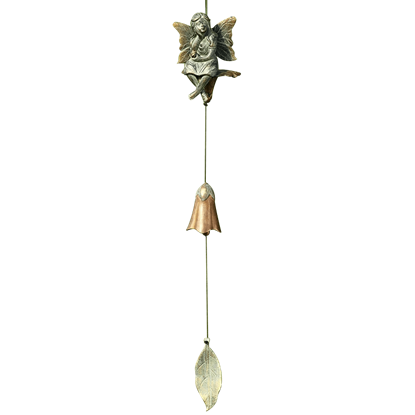 The Fairy Bell Wind Chime depicts one such scene, complete with the gentle tinkling of fairy sounds. 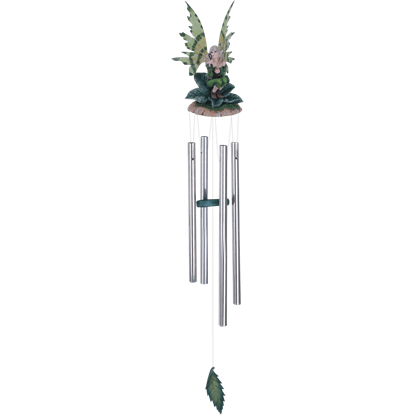 Fill your garden with tinkling music and fantasy style with the Mermaid Fairy Wind Chime. This charming aquatic chime makes an ideal yard ornament for fans of beautiful sea maidens and other magical creatures of the ocean deeps. The Pewter Fairy Wind Chime is a very unique piece. 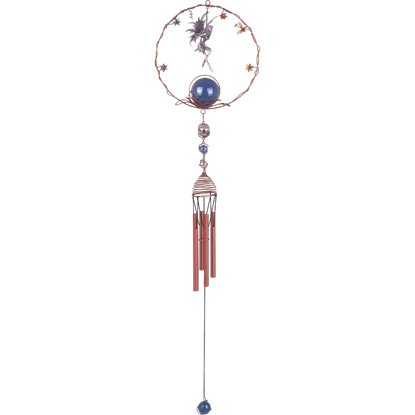 This stunning wind chime features copper base and a pewter fairy. The fairy is surrounded by miniature copper flowers, and is hanging above five blue and white spheres. The Woodland Dragon Fairy Wind Chime features a woodland fairy dressed in beautiful green sitting on a toadstool holding a crystal ball. There is a purple dragon sitting diligently next to her, creating a fine scene of fantasy style.